New, must-have book is the most spot on political review of the decade! (FAIRPLAY, MARYLAND) – As partisan passions between Conservatives and Liberals grow ever more heated under America’s current political climate - further intensifying global warming - the rancor of debate becomes more foul and divisive. John Cooker, author of the new book Cure Your Democracy: The Infection, Spread and Treatment of Contagious Opinions, has discovered how to defuse the tension: with satirical humor. Extreme partisanship can seem at times like some sort of infection of irrationality. This is exactly what Cooker discovers that is infecting both parties. The infection is viral and is being spread by politicians and pundits! 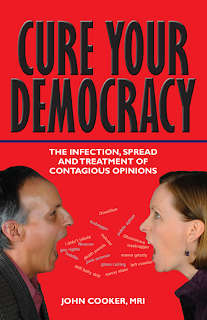 Cure Your Democracy satirizes both camps of the finger pointing, bumper sticker mentality, while offering thought provoking vantage points to view them. If you are tired of the partisan arguing in our great country, this book is guaranteed to lift you to higher ground and make you LOL! About the author: John Cooker is a partner in a real estate development LLC and writes occasionally when inspired. His earlier novel, The Gelwick Faxes, is a terrorist thriller written the year before and presaging the terrible events of 9/11. In dire need, after living through the recent years of constipated political partisanship, he became inspired to react with the most powerful medicine: humor. In an effort to cheer himself and his friends up he wrote Cure Your Democracy. One day Bob called and asked me to give him a “no holds barred” critique of his speaking performance. Bob was an author and a great radio guest—both entertaining and informative—in the middle of a media tour. Bob also was a fantastic speaker, he could capture an audience’s interest and attention from the moment he uttered his first words. He was on the talk show circuit and was doing two and three shows a day. So, why call me? His Amazon ratings were not moving and his radio interviews were not generating book sales. I listened to his presentations and interviews. Bob was talking at the audience; he was lecturing and explaining things to the listeners. He was talking at the audience and not to them. He also was talking about himself and his accomplishments. There was no compelling reason for the audience to take action—to go a web site or book seller and purchase his book. When you are interviewed or speak to an audience, you have to be intentional. You have to be systematic and have a clear sense of purpose about why you are being interviewed or why you are speaking. You have to know why you are there. What is the purpose of your presentation? Is it to inform? Is it to entertain? Is it to call your audience to action? Or, is it all of the above? Your presentation has to have a reason for being, otherwise it gets lost in entertaining talk. If, like Bob, you want to mobilize an audience to action (to buy a book or some other product or service) you have to reach them on a personal and emotional level. You must speak to their emotions and to something they relate to personally; what you say must fit within their frame of reference, not yours. You can’t use the time you have to let the audience know how wonderful you are; nobody cares! Your focus must be on what your subject matter does for them. How does the information you are presenting benefit your audience? If you fail to connect through understanding—empathy—you wind up behind an “empty microphone.” All of your “entertaining talk” will not sell a book, a product or a service. Considering that the reason for Bob’s media tour was to sell his book, the fact that what he was saying was not relevant to his was not serving their needs or his own. He was not relating to his listeners in a way that he was seen as the connection to solving their problem. They listened but couldn’t hear him. They might as well have tuned in to another radio station. If your subject happens to be about health care, for example, make a key point. Then, immediately afterward, tell a story about a father who lost his job and his health insurance. Explain how this caused him to borrow money to buy his sick son medicine. This allows your audience to realize—to intuit—that you emotionally understand their concerns. Now your message is about them, not about you (or about our friend, Bob). 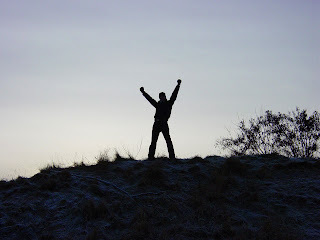 When you introduce a relatable “human factor” scenario into your presentation and then tie that to a solution you are offering, to the benefits in your book, your topic or your point of view, the resultant effect is a call to action—a motivation for your audience to pick up a copy of your book, participate in a seminar or whatever your objective might be. Unfortunately, Bob did neither of these things. Bob did not define why he was speaking in such a way that his audience could personally relate. He, therefore, ended up with no call to action. Remember, communication is about your audience and how what you say will benefit them. It’s about them. It is not about you! Facebook allows you to connect and find new friends and associates, it also allows you to promote your book through various types of Facebook advertisements. These are not free advertisements, however it is very affordable. First, there are two options when it comes to how you pay for the advertising. You can purchase clicks, which is known as CPC advertising, or buy impressions, which is known as CPM advertising. Most advertisers will likely choose CPC, since this means that the advertisement attracted the prospect enough that they actually clicked on the advertisement. With CPM, you can’t even really be sure that your advertisement is noticed. One of the nice things about advertising on Facebook, however, is that the ads can be highly targeted to your desired audience – by gender, age, interests, location, and many other variables. If you don’t believe this, just login to your own profile, and on the right-hand side of the page, under friend suggestions, look at the advertisement there. The chances are very good that it relates to you in some way. There are those who haven't experienced good results from Facebook advertising. However, this is often simply because they are not targeting the right audience. It may take a bit of trial and error to get the results you want, but when you find the right ad, for the right market, the results are astounding. Unemployed, a single mother and frankly, just plain ordinary, J.K. Rowling's outlook on life was dim at best. So, how did she go from the depths of despair to the life of a billionaire? She took an "idea" about which she was enthusiastic and started crafting it into a manuscript, one word at time. That’s it. Magic and wizardry she did not possess, inside connections she did not have. The dedication to bring to life that which would otherwise haunt her until it was produced is how she arrived. So many of us aspire to be writers, we have loved it, lived it, tried it, failed at it and mostly wondered about those who had achieved writing success, "How did they do it?" There is no textbook way of getting there. No "10 steps to arriving." That would be too easy, and besides, the art and spontaneity would be lost. If those we admire most in the field were asked, "How did you do it?" The resounding consensus would most likely be the same.., "We did not quit." "We did not let someone tell us we were not good enough." "We re-submitted again and again." Rowling's first rejection letter came back as quickly as they had received her manuscript. Had she let that phase her, she still may be a teacher and living hand to mouth. Believing in yourself and never giving up sounds cliché, and working when you have no hours left in the day sounds unfeasible. But deciding that you can conquer those will be the difference from "aspiring" to "arriving." When you are taking care of all of your financial assets, it is easy to forget about the most important asset of all: yourself. Beau Henderson, a financial advisor and motivational speaker, has seen firsthand what happens when people become too consumed by their careers to invest in their health and taking care of themselves. In The RichLife: 10 Investments for True Wealth, Henderson offers readers investment advice for both their financial assets and those assets on which they cannot put a price, reminding them that there is nothing more important than the investments we make in ourselves and our relationships. Our health should be the top priority in life; however, for many people who are consumed by their careers, health comes last on the list of priorities. Even the most ambitious executives often forget to take care of themselves, running on very little sleep and often not taking the time to exercise, existing on easy-to-prepare processed foods. Heart disease and high blood pressure often become the plight of those with Type A personalities who have neglected their bodies and themselves while focusing on their careers. By changing our attitudes and remembering that investing in ourselves is as important as investing in our finances; we can change this fate and achieve better health. It is frequently the case that when hard-working people do finally take the time to exercise and schedule time for activities of a physical nature; they are able to manage stress better and find that they are more successful than they were when they were neglecting their health. Although there are many financial issues addressed by The RichLife, Henderson goes far beyond the advice of your typical investment book and reminds his readers that there is much more to living a rich life than having financial wealth. The RichLife is certain to irrevocably change the lives of its readers, offering them a wakeup call and a guiding hand down the path toward improving the quality of life. If you are interested in a review copy or interviewing this author, email me: thepublishingguru(at)gmail.com.